1. Rearrange your shelves and invest in some acrylic bins, labels, and a Lazy Susan to get the most out of your fridge's storage. Check out more fridge organization tips from Clean & Scentsible here. Get similar supplies on Amazon: a set of six stackable plastic bins for $34.99, chalkboard labels for $7.95, and a six-inch Lazy Susan for $8.99. 2. Keep all the plastic bags from your most recent Target run in one stationary place with this bag holder that hangs from any door and stores your bags *inside* your cabinet without taking up any shelf space. 3. Easily locate all your lids with this handy little organizer that'll fit snuggly amongst your mountains of lidless containers. 4. Rid your cabinets of any bulky packaging like pasta, cereal, and snack boxes that take up valuable shelf space. 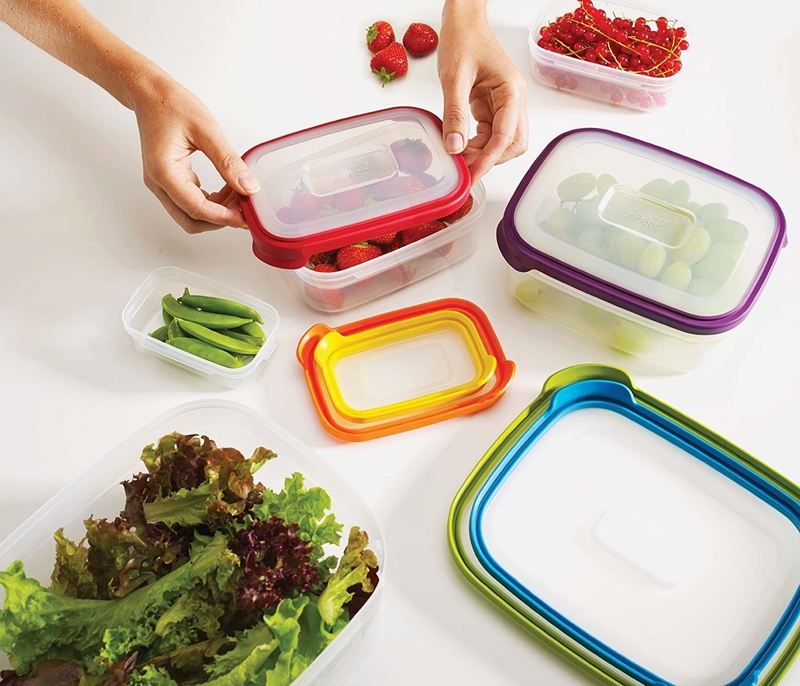 These air-tight storage containers come in four different sizes to help you store foods of any size and keep them fresher longer. Promising review: "These are attractive and make it easy to store pantry items. There are so many storage systems out there, but the thing I particularly like about this set is that all the lids are THE SAME SIZE and all the containers have the SAME FOOTPRINT. This makes it so much easier to organize my pantry. I really love these." —M.W.C. Get this 5-piece set from Amazon for $29.97. 5. Stop frantically looking through drawers and cabinets trying to find your measuring cups and spoons or struggling to remember how many cups are in a quart. Instead, turn your measuring nightmare into a dream by simply painting your cupboard door with some chalkboard paint and adding a few hooks. Get the supplies you need on Amazon: a pack of four fine-tip chalk markers for $12.97, a set of ten small Command Hooks for $9.98 (because they won't put holes in your cabinet doors), and a jar of chalkboard paint for $10.32. Don't have time to paint? Try this chalkboard contact paper from Amazon for $12.99. 6. 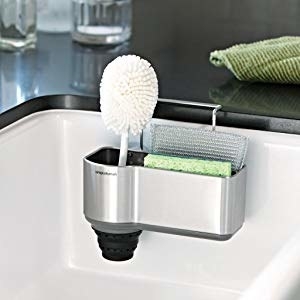 Eliminate some countertop clutter by swapping your paper towel stand for a wall-mounted paper towel holder that also comes with a little shelf to store your dish soap, hand soap, and sponge. Promising review: "I love this thing. We live in a small house so there is not a lot of room in the kitchen and this fits near the sink perfectly. It get my paper towels and spices out of the way. I am thinking of getting one for my travel trailer too." —Michele L.
Get it from Amazon for $11 (available in eight colors). 7. Turn that empty top drawer into handy spice storage with inserts that are designed to hold any spice bottle regardless of shape and will have you wishing you'd bought them sooner. 8. Install an under-sink drawer to keep your cleaning supplies, value-sized dish soap, and new sponges all in one place, so you won't have to use your flashlight to look for them behind the sink pipes. Kayla, a writer here at BuzzFeed, owns this and loves it — check out her under-sink drawer review. 9. Struggling to find a way to store the tops of your pots and pans? Try this lid organizer with six dividers to hold your bulkier lids. It also can be used to store cupcake tins, plates, and cutting boards. 10. Spice up your life (and your kitchen cabinets) without taking up precious shelf space: Pair a sheet of metal with some magnetic tins. These tins come with two types of labels — clear and chalkboard — so you'll never mix up chili powder and paprika ever again. Get the set of 12 magnetic tins from Amazon for $17.95. 11. Take advantage of even the narrowest of spaces with this slide out storage tower. Plus, it has wheels which makes moving it super easy. 12. Turn that awkward corner cabinet into a Lazy Susan. It could work as extra pantry space, easy storage for pots and pans, or as a useful spot to stash your Tupperware. Get it from Home Depot for $49.35. 13. Stick this magnetic knife and utensil holder on any wall in your kitchen or even on the side of your fridge so you'll have all the countertop space to slice, dice, and whisk away. 14. Stack your mixing bowls, measuring cups, and strainer for easier storage with this nine-piece set. This nine-piece set includes: a 4.8 quart (10.5-Inch) large mixing bowl, a 3.2 quart (9-inch) colander, a 1.75 quart (7.5-Inch) steel sieve strainer, a 0.5 quart (6-inch) small mixing bowl along with measuring cups —1 cup, 1/2 cup, 1/3 cup, 1/4 cup — and one tablespoon. Get it from Amazon for $29.88 (available in two multicolored sets). 15. 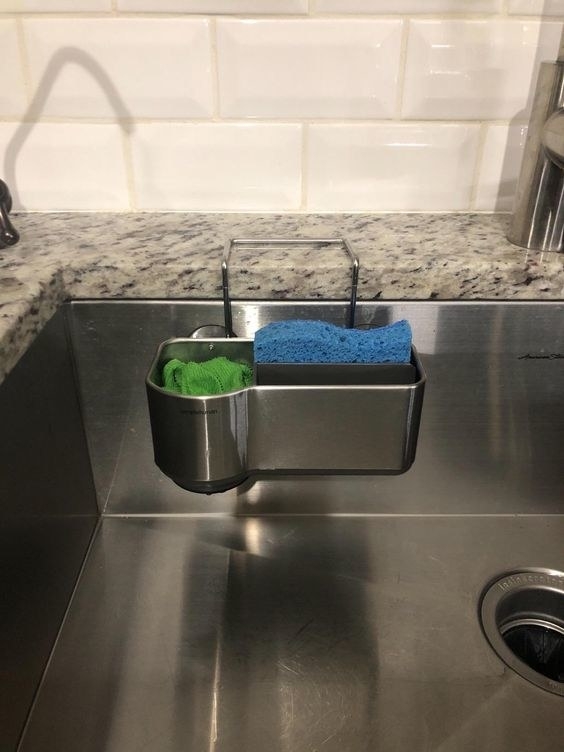 Place a sponge caddy in your sink so your dish sponge isn't just lying around, taking up precious counter space. This caddy is made from rust-free materials so you don't need to worry about discoloration. It has four suction cups to help it stay in place no matter how much water gets on it. The brush holder also extends to hold longer brushes. Plus, it has ventilation holes to help your sponge and brushes dry faster, which ultimately minimizes bacteria growth. WHOO! 16. Mount an organizer rack on your cabinet door to create extra storage for foil, wax paper, and plastic bags. 17. Utilize the space under your shelves with these under-shelf baskets. You can use them to store more food in your fridge or keep extra napkins and garbage bags in your cupboards. Get a set of four from Amazon for $26.92. 18. Organize your cabinets with these stackable shelves that'll help you use 100% of your vertical cabinet space. They're available in silver and bronze. Get a set of two from Amazon for $16.87. 19. Save yourself some shelf storage and the trouble of searching for lids with these nesting food storage containers. These containers are freezer-, microwave-, AND dishwasher-safe. Get the 12-piece set from Amazon for $27.96. 20. 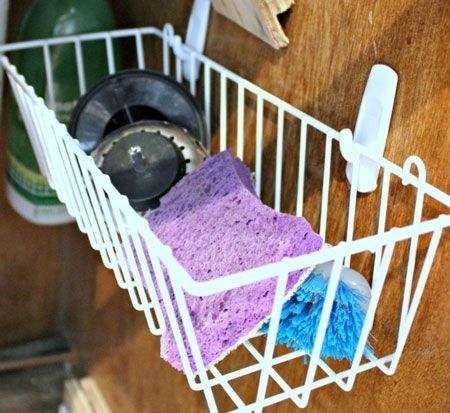 Hang a basket from removable adhesive hooks under your sink to store small cleaning supplies you don't want to get lost amongst the pipes and larger items. 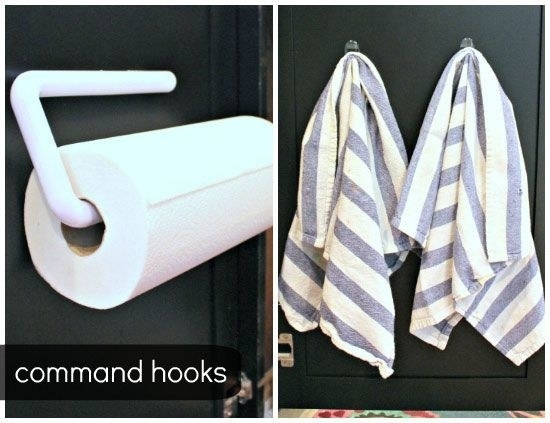 You can also use the hooks for hand towels. For more tips on organizing the cabinet underneath your sink, check out this post. Get a pack of nine Command Hooks from Amazon for $8.99.